ALBANY – Vincenzo B. Commisso, 86, of Albany, NY, surrounded by his loving family, passed away on October 2, 2013 at St. Peter’s Community Hospice Inn after a brief illness. Vincenzo was born on May 16, 1927 in Siderno Marina, Italy to the late Theresa and Raffaele Commisso. He married his beloved wife Concetta with whom he would have celebrated 64 years of marriage on October 29. He left Italy at the age of 24 to come to America. 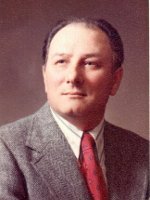 Vincenzo worked in different jobs until he settled as a mason with Callanan Industries for 35 years until his retirement in 1990. A strong, well respected, hardworking family man came to this country for a better life. Not knowing a word of English, he persevered and learned the “American way” to become a successful provider. He was most proud of his three sons who learned from him important life qualities that they will forever live by – respect, strong work ethic and love of family. Beloved husband of Concetta (Galluzzo) Commisso. Father of Raffaele (Josephine), Charles (Rosa), Frank (Castilia) Commisso of Albany. Brother of Domenico (Theresa) of Italy. Grandfather of Tina (Gabriel) Barbato, Vincent P. (Rhiannon Darrone), Vincent C., Salvatore, Michael (Juliana), Vincent J. (Cristina) Commisso and Marisa (Makenzie) Weston. He is also survived by 3 great-grandchildren. Brother-in-law Vincent (Anna) Galluzzo. He was predeceased by his siblings, Francesco Commisso, Lina Commisso Costanzo and Ida Commisso Pellegrino. He is also survived by nieces and nephews in Albany, Italy and Canada. The family would like to thank Dr.’s Carmen Guiliano and Dr. Thomas Schumacher and their staff as well as the Community Hospice for their services and compassionate support. Funeral services will be held in the Hans Funeral Home, 1088 Western Ave., Albany, Monday morning at 9:00, and from there to St. Vincent DePaul Church, 900 Madison Ave., Albany. Relatives and friends are invited, and may call at the funeral home Sunday from 3-7 pm. Entombment will be in the St. Agnes Cemetery, Menands. In lieu of flowers, donations may be made to Community Hospice of Rensselaer County, 295 Valley View Blvd., Rensselaer, NY 12144, or communityhospice.org or the National Kidney Foundation. To leave a message of condolence for the family, send a sympathy card, or obtain directions to the funeral home, please visit www.HansFuneralHome.com. So very sorry for your loss. Thoughts and prayers to your entire family. Sincerest condolences from our family to yours. We were blessed to share our hospice experience with you. May you find comfort in knowing that your Dad was surrounded by your faith and love in his final days. Our thoughts and prayers are with you. I Nipoti Vincenzo, Elisa (moglie), Francesco (figlio) Commisso si associano al vostro dolore.. Le più amate condoglianze. Our deepest sympathy for the loss of your father. Our prayers are with you. Your father was indeed an imposing man while we were growing up. I had a lot of respect and fear of him as with all of our parents. When I last saw him this past summer he still put me in my place in regards to an incident that happened over 30 years ago. God bless him. I am so sorry for your loss. My thoughts and prayers are with you during this difficult time. I hope the memories you have shared with your father will provide you some comfort. If there is anything that you need, please let me know. Carissimi zia e cugini,siamo molto dispiaciuti per la perdita dello zio comprendiamo il vostro grande dolore ma anche nostro e preghiamo per lui che riposi in pace con tutto il nostro affetto vi siamo vicini,Lina Felice e Giuseppe! Carissima zia,carissimi cugini vi esprimiamo le più sentite condoglianze per la perdita dello zio. In questo momento di dolore siete nei nostri pensieri..ci stringiamo a voi,Patrizia,Sergio e figli. Sentite Condoglianze per la grave perdita; ci uniamo al vostro dolore e preghiamo per la sua anima..
My sincere condolences to the Commisso Family. cugine:graziella mariachiara e laura belcastro. Over the years I have often thought of Vince. I was a young Laborer with Callanan working with Vince. I think back about his patience, his work ethic and doing a job that your proud of that he instilled in me. That is what I remember about Vince Commisso. My deepest regrets. A true gentleman has passed. Le piu’ sentite condoglianze a Concettina, Raffaele, Charlie e Frankie, e a tutti i Vostri cari, per la scomparsa del cugino Vincenzo dalla Famiglia Romeo di Cincinnati e di Parma. Speriamo di rivederVi tutti presto. Mio padre, Antonio Romeo, amava e rispettava molto il caro Vincenzo.